Back in July of 2017, I woke up having had the most bizarre dream. I dreamed we were taking Christmas for the City to Las Vegas. In my mind, it was almost laughable! I was encouraged to process this a bit more, so I started by looking at the meaning and origin of Las Vegas. As I researched, I found that the area was discovered by explorers right around Christmas time. These explorers were amazed to find this beautiful area in the middle of the desert thus naming it Las Vegas, translated as "the meadows" or "fertile plains." The fertility was due to the presence of the artesian springs in what otherwise would have been a desert landscape. This caused me to think of the phrase "streams in the desert." There is a story in the Bible (Genesis 16) about a slave named Hagar who ran away from her mistress due to being mistreated. In this story (Gen. 16:7) it says, " The Lord’s angel found Hagar near a spring of water in the desert—the spring that is along the road to Shur." That really struck me. In the middle of her struggle, this wilderness, Hagar found a spring! Hagar's name means "forsaken, flight, a stranger, one that fears." Shur means "wall or ox." I imagine she felt like she hit a wall at that moment. Obviously she was afraid, but she was also legitimately thirsty. Not only did she find a spring, but she was found by an angel. In this story Hagar called the spring (or well) "well of the living One that sees me" (Beer Lahai Roi). She had been discovered! Her thirst was quenched and her heart encouraged. She was noticed! How does this have anything to do with Christmas for the City? 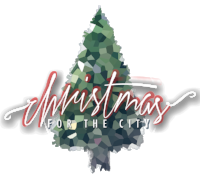 Every year I am amazed at the number of churches, organizations and individuals who choose to devote their time to serve our community at CFTC. I am equally amazed at the number and diversity of the guests who walk through the doors of the Benton Convention Center. We have so much going on in our world, nation and even our city. We also all have various circumstances surrounding our own lives. Yet, we still come together. It doesn't matter who you are or what you have going on in your life. Literally, everyone is welcome. It is my hope this year that each volunteer and each guest experiences what would be equal to discovering a spring in the middle of the hot desert. There is life and joy associated with Christmas and for some pain and sorrow. My prayer is that CFTC can be that place for ALL to experience a refreshing, joyful time together, no matter the context of their life. If you have joy, share it and notice (see) those around you. If you need joy, drink it in, be "seen". We are excited about what this year may hold. Join us either as a volunteer or a guest, but join us nonetheless! Let's have a meaningful Christmas experience together! In the words of Tiny Tim from A Christmas Carol: "God Bless us, every one!"